Official FIFA rankings indicate that the Socceroos, ranked 36th, are the underdogs of the world. But that isn’t enough for us Aussies. An estimated 15,000 Australians flew out to Russia for the Socceroos’ opening match of the 2018 World Cup, and cleared out Kazan’s beer supply in one night. Love them or hate them, there’s no doubt the Socceroos continue to shape our national identities. We wanted to find out who are the Socceroos’ main fan base, the most popular players and whether Optus’ botched streaming fiasco could hurt our national pride. 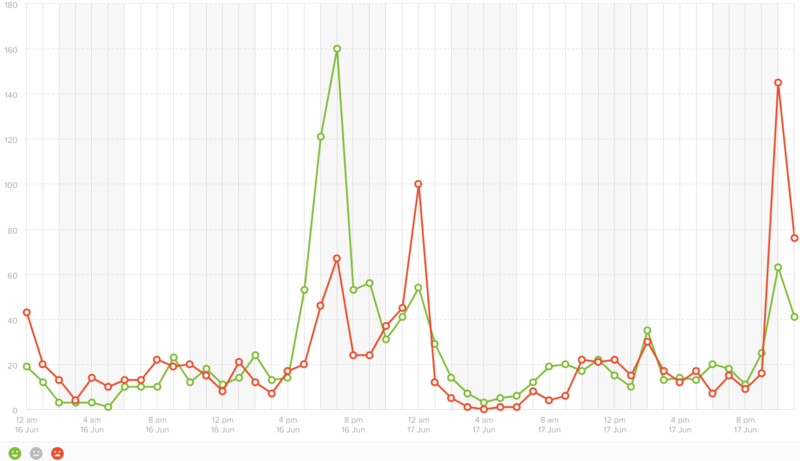 This analysis was put together using the Workbench tool in Social Studio. What is the Social Studio Workbench? 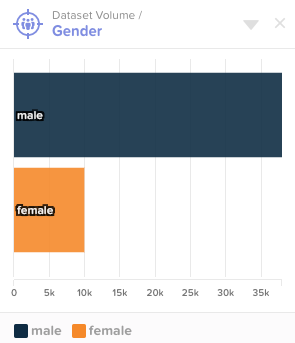 The Social Studio Workbench is a tool that takes your data or social account, and breaks it down to key components such as demographics, volume trend, and sentiment. This allows you to inspect your data or social account online on a microscopic level – so you know exactly who are talking about you, and what they are talking about. Who’s interested in the Socceroos? 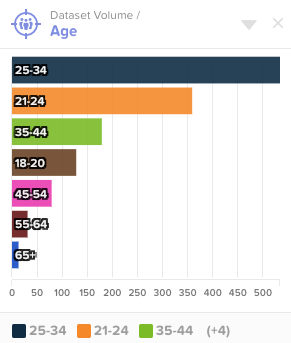 Out of all of the chatter online gathered by Social Studio, people talking about the Socceroos are mostly males, aged 25-34, living in Australia. 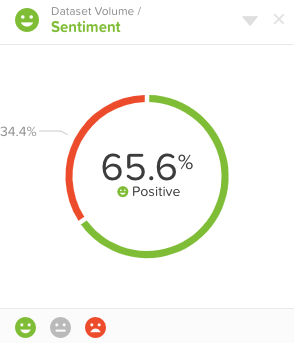 Fans are quite positive towards the team, with 63.9% of posts with positive sentiment. Unsurprisingly, much of the pre-game chatter was generated by Sydney, followed by Melbourne, Brisbane, and Gawler. 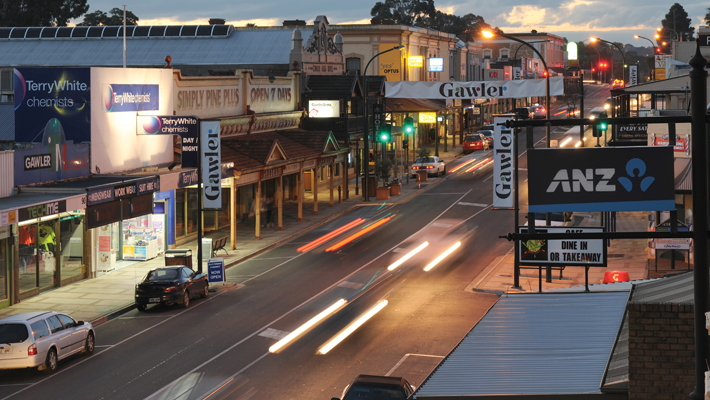 Gawler, in South Australia, is the hometown of teen superstar Riley McGree – no doubt experiencing world cup fever greater than that of Canberra and Adelaide. Who’s the best player of them all? Prior to the Australia vs France match, goalkeeper Brad Jones was the most talked about player followed by Socceroos captain Mile Jedinak, and Tim Cahill. After the Australia vs France match we can see a shift in player popularity, with Jedinak taking the top spot, followed by Mathew Ryan, and Aziz Behih. If we focus on Jedinak, we see that in recent days he has been generating negative sentiment. This is attributable to controversy over the use of VAR line technology in determining Australia’s loss, as well as the upcoming Australia vs Denmark match. With sport sponsorships, brands count on the sporting event to generate a halo effect – causing spectators to associate a positive vibe for the event with the sponsors. This, in turn, theoretically strengthens the credibility and impression of the sponsor. Optus was awarded a highly lucrative, exclusive streaming deal in Australia. 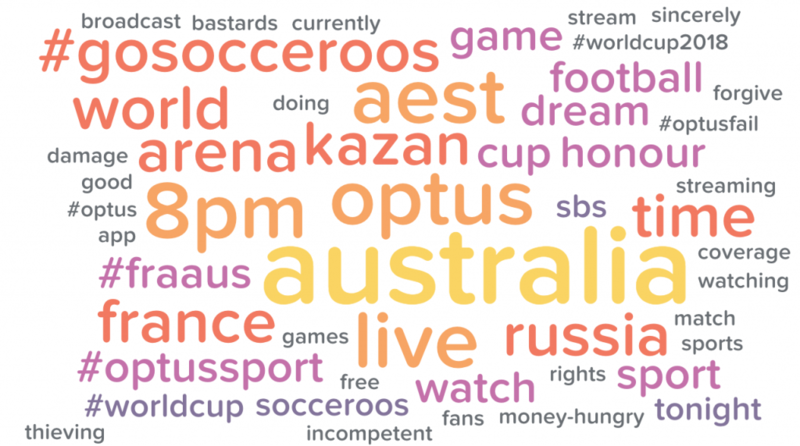 When technical issues plagued Optus’ coverage in the opening matches of the World Cup, fans quickly turned to social media to express their outrage, generating #floptus, #optarse, and #optusfail. But could something like a botched streaming service affect Australia’s passion for the Socceroos? The answer is yes. 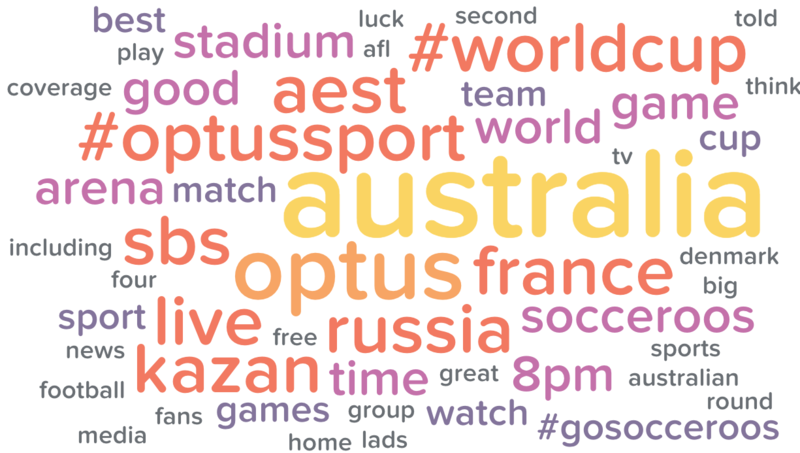 In the one week leading up to the fateful Australia vs France match, the Socceroos, when associated with Optus keywords, generated a 65.6% positive sentiment in online chatter. 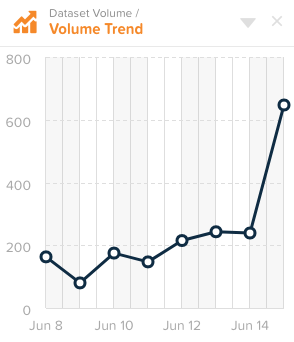 We can also see fans becoming quite excited, with a steep increase in volume and passionate words such as “best”, “Australia”, “luck” in their posts. 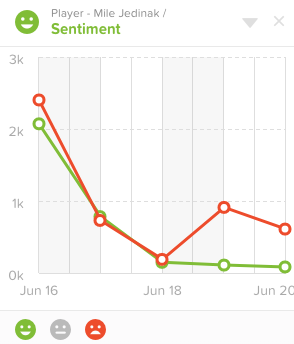 However, once the streaming issues started to manifest, we see the sentiment tide turn quite quickly in the opposite direction. Within a few hours of the match kicking off, we can observe a huge spike in negative sentiment for the Socceroos when associated with Optus, with about 47000 mentions within the next 48 hours. We also see words such as “money-hungry”, “damage”, and “incompetent” being used as fans vented their frustration and anger. The key takeaway is this – sponsorships are a peachy affair. Whether it’s done right way or not, there’s a huge potential for brand awareness.